Ribbon Cutting for Econo Car Rentals, Inc. Greater Riverview Chamber of Commerce members conducted a ribbon cutting ceremony in September to recognize Econo Car Rentals Inc. name change. It was formerly known as Econo Auto Rentals. Econo Car Rentals is located at 9017 E. Adamo Dr. Ste.115 in Tampa. Call 999-4920 or visit www.Econoautorent.com. Christian Brothers Automotive will conduct a National Service Day on Saturday, October 18. Christian Brothers will open its doors to serve the local community, providing the facility, the expertise and the tools to minister to widows and single mothers and their families. For more information on this event, call 699-3197 or visit locations. cbac.com/brandon/. Christian Brothers Automotive is located at 10010 McMullen Rd. Belle of the Ball Project will provide homecoming dresses and accessories to in-need, low-income high school girls on select Saturdays this fall. The dates are: October 10 and October 24 from 10 a.m.-2 p.m. at its boutique located at 1210 Holt Ave. in Clearwater. Dresses are available to all greater Tampa Bay area in-need, high school girls only. We respect the honor system. No referral letter is necessary. No appointment needed. Donations of dresses and accessories can also be made at the distributions, dates/times listed above. Call 727-386-4502 or visit www.belleoftheballproject.com. Beginning Monday, November 2 through Friday, November 6 Superior Residence and Senior Helpers will host a free Memory Screening from 10 a.m.-4 p.m. Additionally on Thursday, November 5 a Virtual Dementia Tour will be offered by appointment from 2-7 p.m. This tour will allow caretakers to understand what a person with dementia is going through, how they feel and what they experience. Call 657-8587 to make a reservation. Superior Residence of Brandon is located at 1819 Providence Ridge Rd. in Brandon. Visit www.superioralf.com/location/Brandon. National Assisted Living Week was celebrated by 70s day at The Crossings at Riverview complete with disco balls, lava lamps, live 70s music and food and libations. The Crossings is located at 8451 U.S. Hwy. S. Call 671-0222. Creative Kidz Learning Academy has recently renovated and re-opened under new management. Hours of operation are from Monday to Friday 6 a.m.-6 p.m. and Saturday from 6:45 a.m.-5 p.m. Later evening hours are also available. It also offers a Parents Date Night Childcare once per month. Parents have an opportunity to reconnect while their children have a safe fun filled night movie and pizza night supervised by its teachers. Creative Kidz is located at 6130 Florence St. in Gibsonton. Call 677-1300. Thrivent Financial hosted a ribbon cutting ceremony in September to let everyone know that it has expanded. Thrivent Financial is about helping people. As an example of its client’s giving back, guests were asked to bring diapers, underwear or socks to help support an effort to stock up baby supplies at ECHO. Thrivent does more than help you manage your finances. They help you make wise money choices through every phase of your life. Call 626-5489, visit www.thrivent.com or emailmatthew.oleson@thrivent.com. The Bridges Retirement Community was recently granted a citation-free survey by The Agency for Healthcare Administration, the state agency that oversees the operations of all assisted living facilities in Florida. The survey process inspects all areas of an assisted living facility through private interviews conducted by the surveyors. The Bridges Is located at 11202 Dewhurst Dr. in Riverview. Visit bridges retirement. com or call 413-8900. Visions of Hope International is proud to welcome Brenna Taylor as its new event planner. Event planning is no stranger to Brenna Fields Taylor, owner of An Elegant Affair – Wedding and Event Planning. Visit vhinternational.org. Lasting Impressions Laser recently held a ribbon cutting to celebrate its brand new machine. It has offered professional medical aesthetic treatments for over seven years in the Apollo Beach area. It is excited to introduce the next generation of laser technology for skin tightening, laser hair removal, and skin rejuvenation. It is located at 201 Flamingo Dr. in Apollo Beach. Call 645-7502 or visit www.lastingimpressionslaser.com. Pivot Charter School is a unique program merging the best of state-of-the-art Learning Centers, individualized instruction and tutoring by Florida Certified teachers, and innovative online curriculum to provide students and parents an outstanding educational experience. Pivot offers small class settings for middle school and high school students. Pivot Charter School is located at 3020 South Falkenburg Rd. in Riverview. Visit pivotcharterschool.com or call 626-6724. 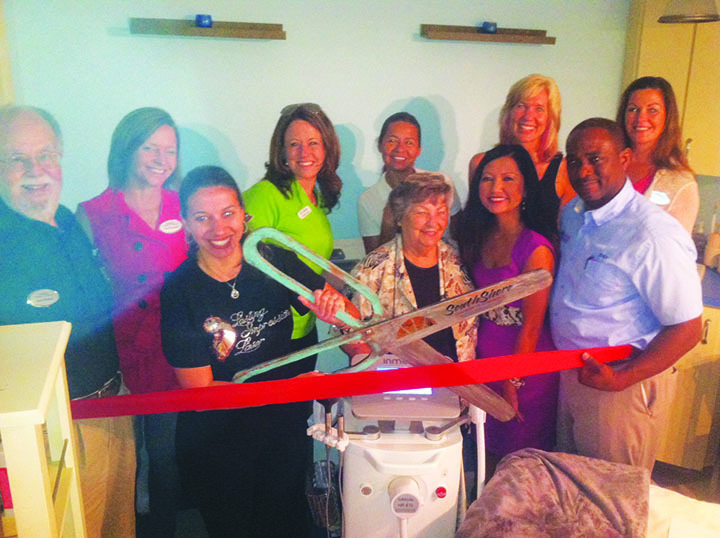 Fifi’s Fine Resale Apparel recently held a ribbon cutting. Fifi’s has been in the consignment business for over 20 years specializing in the resale of designer and name brand apparel for women with over 20 boutiques in North Carolina and Florida, including its headquarters in Apollo Beach. Fifi’s is located at 1042 Bella Sol Way Ste. 202 in Apollo Beach. Call 941-685-0434 or visit www.fifisconsignment-apparel.com. HN Wealth Management offers income planning and preparation for personal and business taxes, financial planning and investment management. Office hours are Monday through Friday, 9 a.m.–4 p.m. with after hours and weekend appointments available. Call 530-4618 or visit www.hn wealthmgmt.com. HN Wealth Management is located at 13452 Boyette Rd. in Riverview. Carrier Enterprise held its annual awards dinner in August where Progressive Air Systems, Inc. was awarded Florida Achievement Award of over $3 million and Florida Achievement Award for Business Plan Achievement. Owner and President Bill Rogers attributes the success of the company by providing exceptional customer service, offering competitive pricing with no overtime fees and continuous training. Progressive Air Systems is a full service heating and air conditioning contractor. It specializes in residential, new construction and light commercial projects. Call 727 847-3898 or visit www.progressiveairsystems.com. Mark DeHaan, vice president and community development manager of the West Florida Division of the SunTrust Foundation, recently presented Earl Pfeiffer, Florida Home Partnership (FHP) executive director, with a check for $2,500. FHP is a non-profit Community Housing Development Organization (CHDO) specializing in the USDA Mutual Self-Help Homeownership Mortgage Program. The FHP staff are professionals in various areas of master-planned communities, single and multi-family home construction, homeowners’ association initiatives, housing rehabilitation, and green building. Call 672-7889 or email joey@flhome.org. Members of the SouthShore Chamber of Commerce took part in a recent ribbon-cutting ceremony at Creative World School located at 5931 Frond Way in Apollo Beach to celebrate new ownership. For more information on its services, call 649-1820. Dr. Daley and Daley & Associates PrimeMed of Tampa Bay hosted its open house to local community physicians. Dr. Daley commenced seeing patients in a new Brandon office in July. Daley & Associates PrimeMed of Tampa Bay is a traditional Internal Medicine practice with offices in Brandon and Bradenton. Patients enjoy a full range of comprehensive health services including preventative health and wellness counseling, and diabetic teaching. It is located at 631 W. Lumsden Rd. in Brandon. Call 530-0903.